The birth of “Murrina Jewellery"
By dipping this into different pots of molten Murano glass, the volume of the mass increases and it is made up of layers of different colored glasses. 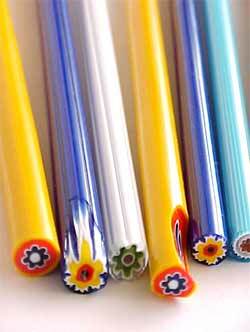 Nowadays only two firms in the world can realize the Venetian Murrina glass stick, by exerting a longitudinal depression into it with a particular instrument, until the hollow becomes closed; then they dip the glass again into a particular instrument, called “crogiolo”. 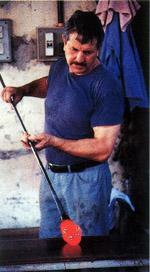 In this way they achieve a real Venetian Murrina glass stick. 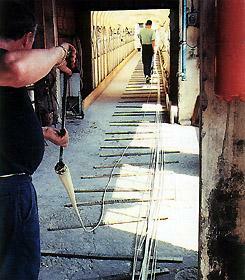 However, they are able to satisfy just a small part of the innumerable requests. This is because of the difficulty in finding highly specialized staff, who knows this particular technique, and the lack of young and motivated Murano master glass-makers. 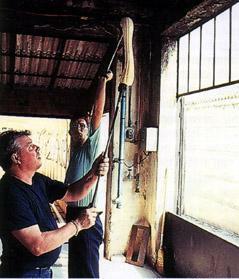 Murrina sticks : The artist then places the millefiori beads (small cut pieces of the rods) into a frames in a unique design. 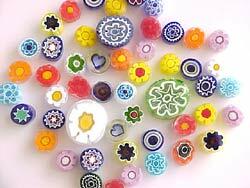 Each piece of millefiori glass jewelry is still made by hand and thus no two pieces are exactly alike. Murrina sticks cut : The frames with the millefiori design then are cooked in a glass oven at temperatures secrets. All the millefiori designs are then polished and made round. 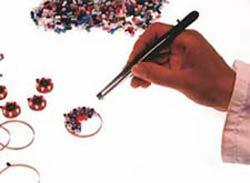 Then the production of the Millefiori Jewelry starts. Millefiori pendants in silver and gold, millefiori earrings, millefiori key chains, millefiori watches, millefiori plates, millefiori pins, pill holders, and more are made with this ancient way to use the Murano glass.